The rift must be closing. LOL! Prior research has suggested that it takes a very long time for water in the Pacific Ocean to circulate down to its lowest depths. This is because it is replenished only from the south, which means it takes a very long time for water on the surface to make its way to the bottom—perhaps as long as several hundred years. That is what Gebbie and Huber found back in 2012. That got them to thinking that water temperature at the bottom of the Pacific could offer a hint of what surface temperatures were like hundreds of years ago. To find out if that truly was the case, the researchers obtained data from an international consortium called the Argo Program—a group of people who together have been taking ocean measurements down to depths of approximately two kilometers. As a comparative reference, the researchers also obtained data gathered by the crew of the HMS Challenger—they had taken Pacific Ocean temperatures down to a depth of two kilometers during the years 1872 to 1876. The researchers used the data from both projects to build a computer model meant to mimic the circulation of water in the Pacific Ocean over the past century and a half. Someone ought to send this to Ocasio - Cortez and her plans for a 'green fund' for AGW (of course she now calls it Climate Change). But it seems to me the northern hemisphere is entering the first stages of a cyclical cooling phase that appears to be about 400 years in length. The last cold phase being from 1300 - 1700 (in its most extreme). And it all has nothing to do with carbon. Of course this will receive almost no attention from the mainstream media. On alert for the next 'super storm' to confirm the AGW (revised) hypothesis that ALL weather anomalies are a product of Global Warming even those that are better characterized as cold weather events (like storms). Last edited by coldstream; Jan 4th, 2019 at 01:36 PM..
Rifts don't close, they quit expanding. If the ring of fire stopped expanding and the descending continued at the same rate Hawaii and the crust around her would start sinking at a rate that would take up the slack. In Africa Mt Kilimanjaro would become a sinkhole with a lava lake at the bottom of it. BTW, trying to use a scientific article as a 'hit-piece' on somebody who might be able to reply in a way that makes you inferior for not even questioning any part of the report you are using. You failed to show if this same person has anything else right. Lately I close the vid if they even hint they are a 'flat earther' by way of 'proof'. is likely due to the Little Ice Age, which ran from approximately 1300 until approximately 1870. Prior to that, there was a time known as the Medieval Warm Period, which had caused the deep waters of the Pacific to warm just prior to the cooling it is now experiencing. A pair of researchers, one with the Woods Hole Oceanographic Institution, the other Harvard University, has found evidence of deep ocean cooling that is likely due to the Little Ice Age. They are funded by whom?? Prior research has suggested that it takes a very long time for water in the Pacific Ocean to circulate down to its lowest depths. This is because it is replenished only from the south, which means it takes a very long time for water on the surface to make its way to the bottom—perhaps as long as several hundred years. That is what Gebbie and Huber found back in 2012. That got them to thinking that water temperature at the bottom of the Pacific could offer a hint of what surface temperatures were like hundreds of years ago. To find out if that truly was the case, the researchers obtained data from an international consortium called the Argo Program—a group o f people who together have been taking ocean measurements down to depths of approximately two kilometers. As a comparative reference, the researchers also obtained data gathered by the crew of the HMS Challenger—they had taken Pacific Ocean temperatures down to a depth of two kilometers during the years 1872 to 1876. The researchers used the data from both projects to build a computer model meant to mimic the circulation of water in the Pacific Ocean over the past century and a half. Is that not assuming the same water makes the trip rather than the transfer of heat can take place even when many different layers are present. The spot where the floating plastic is in the ocean would seem to be a location where water is sinking and it seems to bring plastic to that spot from all over the Pacific. The surface currents are mapped out pretty good so the volume of water making it to that spot is how much water sinks. The dia of the down-flow would determine how fast it is moving and that rate would be the same where the water starts coming back up. Did those sailors back then pull the rope up by hand so fast that the temp on the device did not change?? The model showed that the Pacific Ocean cooled over the course of the 20th century at depths of 1.8 to 2.6 kilometers. The amount is still not precise, but the researchers suggest it is most likely between 0.02 and 0.08° C. That cooling, the researchers suggest, is likely due to the Little Ice Age, which ran from approximately 1300 until approximately 1870. 0.02-0.08 is not precise?? They also need the readings for all the years in-between. Records for the Pacific cannot be use for the medevil warming or the mini ice-age as they at in the Atlantic and that is a different ocean. Northern Europe is affected by how fast or slow the Atlantic Rift is going. Prior to that, there was a time known as the Medieval Warm Period, which had caused the deep waters of the Pacific to warm just prior to the cooling it is now experiencing. The cooling is now due to coming out of an extra warm period, why would that mean another ice-age of it was not following a pattern that already exists and the speed of the expansion of the oceanic rifts. The Little Ice Age. 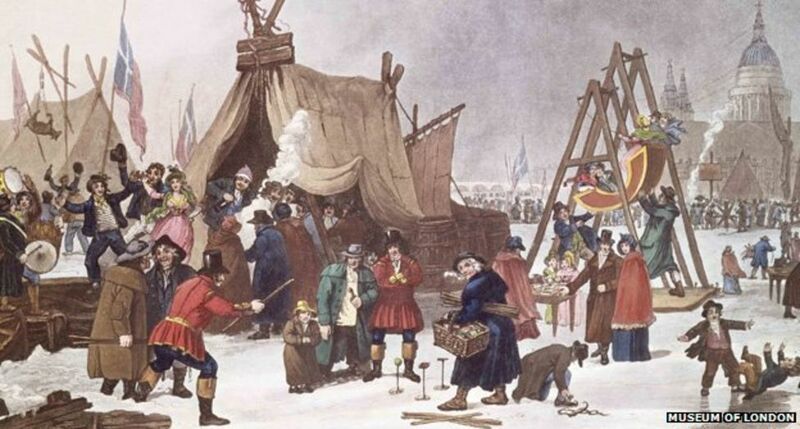 During the winters Frost Fairs used to be held on the frozen River Thames in London, the last being in 1814. Maybe we'll see them again soon. A few years back we were discussing this effect. I believe it was Tonnington called it the elevator effect and is about a 300 year cycle. How do you slow down water's ability to transfer heat at a fast rate? I can understand them promoting cold water sinking, how are they able to sink water that is warm as it would have been before the mini ice-age. The heat moves before the water which follows, of course. And I wouldn,t be surprised if the water didn,t move at all. I,d like to read any arguments, is the water moveing or just the heat? its like electron and holes. A nice burg is like a heat hole on a warm sea. Water carries the heat in each zone. The depth of the layer might be quite thin (sun heated water would tend to spread sideways faster than it would sink and many layers are needed before the heat released by something like the 'black smokers' breaks the surface of the water. Currents would also play a role in how far away that was from when the heat and gas first entered the water. The mantle also has similar layers and the magma is a thin liquid rather than semi-solid all the way up to the bottom of the crust. The material that comes out at Hawaii is as cool as it gets before it starts descending. Not really the putty that is the popular theory in many vids, Heats flows towards the cold spot, that is the top of the atmosphere rather than at the bottom of the ocean. The deepest drill hole is in Russia, they stopped when the temp reached 300deg. A blueish white hole. I discovered Bluish white holes. Don't you still have digging to do in your country before the ocean claims it?? About planting a flag on an Iceberg?? The running part when she flips over is when most people decide to move. Funny how that mini ice age changed course in the industrial age. Is that the point here, Pete? You are pinning solar output to industry? I hope not. It's the timeline to intrigues me. Nothing more, nothing less. Remember the movie "The Day After Tomorrow"
We're all going to DIE!!!!! ..and now for a public service message from our sponsors! Oh look! Yet another meme tard post! If I am wrong and it's because you just stoked out and can't type anymore, maybe you should go see a 10% effective Doctor...keep the math balanced. They need victims to practice on to hold onto their place as the third biggest killer on the planet. Especially now that they know that anti cholesterol drugs cause dementia which does cause people to type out empty posts, which I suppose could also be caused by lack of 02 to the brain because of a bad heart. Last edited by Danbones; Jan 6th, 2019 at 08:13 AM..
Wasn't that the movie predicting the opposite of what all the random internet experts are predicting now? and everybody had to move south? Maybe Trump shouldn't build that wall heh? PS the right to free speech covers Meg's content, it does not apply to posts like yours with no speech in them. Players take the puck, GOONS take the man. I love winter and I can't wait for more. Last edited by Danbones; Jan 6th, 2019 at 08:28 AM..
Be gateful and F**k off!